The Hulk is dead. Long live the Hulk? Killed off as part of Marvel's lackluster Civil War II event, the Hulk returns to Marvel in a new series from writer Al Ewing and artist Joe Bennett. Focusing on neither Bruce Banner or the Hulk (or any character that will survive long enough to appear in issue #2), the first issue centers around a gas station robbery and triple homicide. When one of the victims' bodies goes missing from the morgue through a rather huge hole in the wall to take out vengeance on the man responsible the world gets their wake-up call that the Hulk is back. 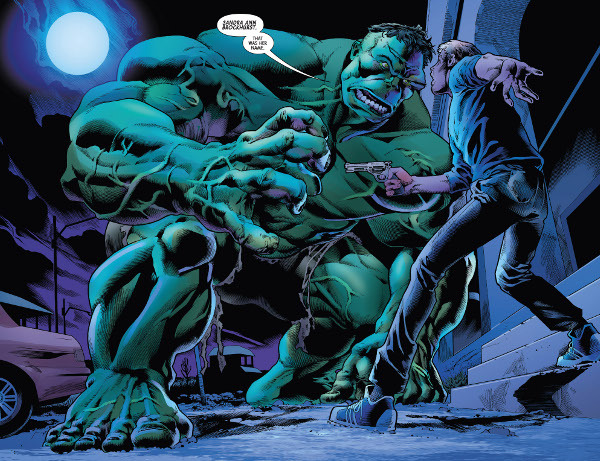 Ewing jumps back to the Hulk's roots (although allowing the character to retain his more recognizable green skin rather than the original gray) with the figure only appearing at night. However, there are a lot of unanswered questions. Where has Bruce Banner been hiding this whole time? How has no one noticed that the Hulk is alive? And what is the new trigger? Is it Bruce's death that brings out the Hulk, or the rise of the moon? And why does the Hulk retain Bruce's intellect but not his personality. For fans.